Founded in 1994 and still managed by Jane Knight, author and analyst working in the e-learning world for over 20 years, the e-Learning Centre provides a Resource Area containing a large collection of links to e-learning resources, which are freely accessible to the public, a (password-protected) Subscribers Area containing resources that add value to the core materials at the website, and a range of other services, e.g. 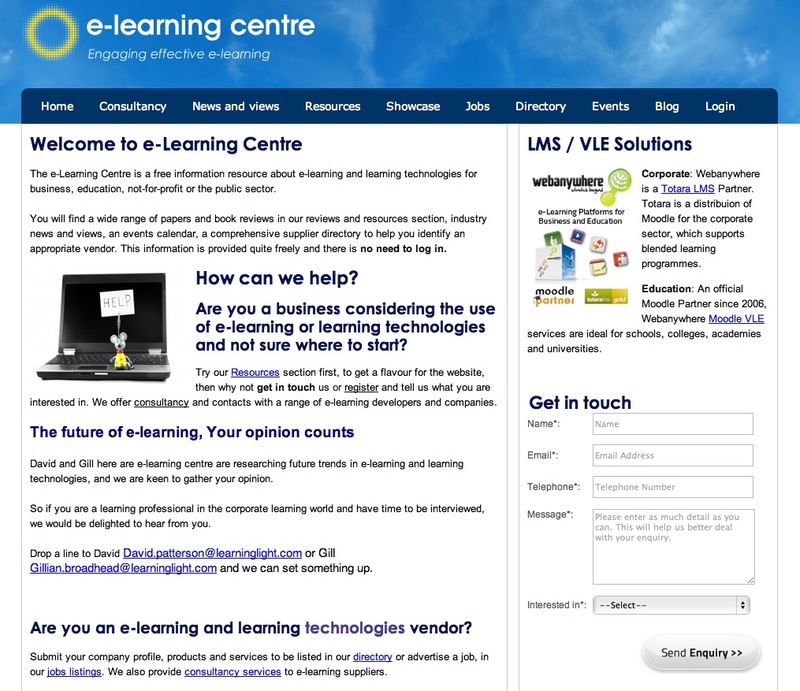 a Guide to e-Learning and an e-Learning Job Centre. Started as a a collection of bookmarks, the project has grown to hundreds of pages linking to thousands of links about e-learning. The links in the Resource Area are categorised into five main sections: Library, Showcase, Products and Services, Events, Bookshop. The e-Learning Center also provides a comprehensive listing of conferences, articles, tools, associations and everything else users might need to know about e-learning in a clear and friendly web structure. Materials are mostly provided free of charge, although some contents are available by paying a reasonable fee.